Aged up to 16 months. It's not only age that separates our cheddars, but character as well. 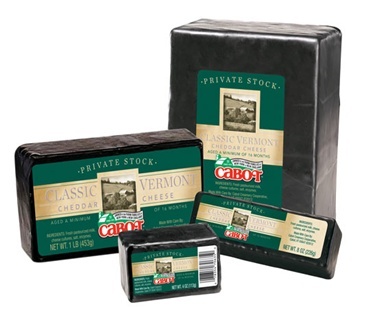 For Cabot Private Stock, we hand-select the cheeses with the smoothest texture and cleanest cheddar flavor, then gently age them. The result is what some of our long-time customers call the ''best of the best''. Full-flavored yet elegantly refined, this is one of the most velvety, natural cheddars you'll ever experience. Simply the smoothest extra sharp around. 1. Preheat oven to 425 degrees F. Line baking sheet with parchment paper. 2. In saucepan, heat water, butter, salt and sugar until butter is melted. 3. Add flour all at once and stir vigorously until mixture breaks away from side of pan and forms smooth ball. 4. Remove from heat and let rest for two minutes. Beat in eggs one at a time, stirring quickly so egg doesn't cook, until dough is firm, smooth and waxy. 5. Add all of cheddar, all but 2 tablespoons of Parmesan, mustard and red pepper, and stir until well blended. 6. Transfer mixture to a pastry bag fitted with large plain tip. Pipe dough into two dozen small round mounds, evenly separated. Sprinkle tops with remaining Parmesan. 7. Bake for 10 minutes. Reduce oven temperature to 375 degrees F and bake for 20 to 25 minutes longer or until completely golden brown. 1. Beat together cream cheese, salmon, chives and hot sauce. 2. Stir in sour cream to achieve proper consistency for filling. Stir in red peppers. 3. Make small slit in side of each gougere. Scrape filling into pastry bag or plastic bag. Cut off corner and squeeze some of filling into each gougere. Recipe courtesy of Liberty Hill Farm, Rochester, VT.
Our third time ordering this block for our home; amazing! We used to have Cabot all the time on the east coast. Now that we live west, nothing quite cuts it like Cabot! I buy 10-30 pounds per year. Have for several years. This year's product is more like white velveta than aged cheese. The flavor is bland in comparison to past years and the texture is velveta rubbery' Very disappointed. Sharp cheddar cheese is my favorite. I have traveled the world tasting different sharp cheese and this by far is the best I've ever tasted! I melt this cheese on homemade bread for breakfast in the toaster oven. Eat it with fruit for dessert. Use it to make gratin potatoes and cauliflower. And slice it for sandwiches. The flavor and bite are perfect.